An exhibition of the life-long work of Helen Mayer Harrison and Newton Harrison, pioneers of ecologically-oriented art, whose visionary proposals have influenced long-term public policy in the United States and abroad. For more than forty years, the Harrisonsʼ expansive practice, realized in collaboration with experts from other disciplines and often commissioned by government and art institutions, has been to map out specific geographical areas at ecological risk to encourage public discourse and community involvement. Their impassioned works serve as both a meditation on global ecology and also as a futuristic vision, often with proposals for environmental change and recovery. 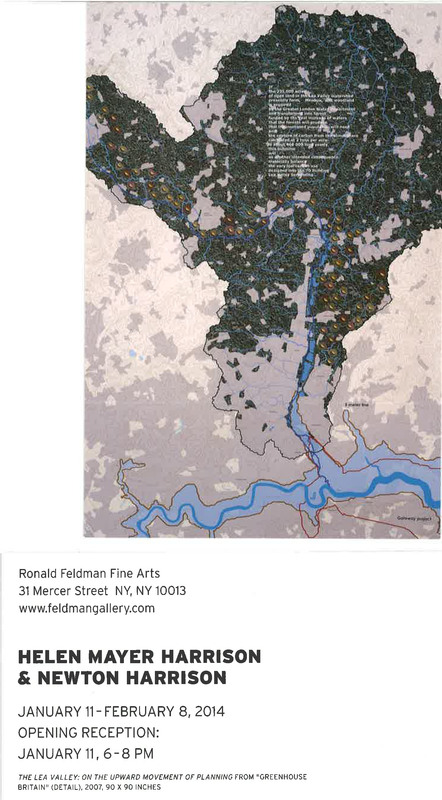 Helen Mayer Harrison and Newton Harrison, Emeriti Professors in the Visual Arts at UC San Diego and currently research professors with the Digital Arts + New Media (DANM) MFA Program at UC Santa Cruz, have been represented by Ronald Feldman Fine Arts since 1974.